Night of the Living Dead – 50th Anniversary! This film is a part of a Double Feature with Alien. When two movies that are screening in the same theatre are grouped under the same thematic heading, one ticket is good for both features when viewed back-to-back on the same day (except as noted). Judith O’Dea, Duane Jones, and Marilyn Eastman. 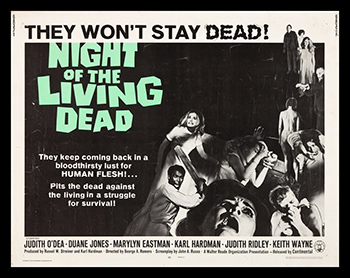 Today we are inundated with zombies in film and television, but imagine seeing this low-budget, black-and-white vision of horror when it was released 50 years ago. Needless to say, the audiences of 1968 were appalled, and yet they couldn’t look away from a film that seemed to reflect all the ugliness of late ‘60s America.